The Jagannath Temple in Puri, Odisha, is one of the holy char dham abodes of God that are considered to be extremely auspicious for Hindus to visit (the others are Badrinath, Dwarka, and Rameshwaram). If you don't let money-hungry Hindu priests (locally known as pandas) mar your experience, you'll find that this massive temple complex is a remarkable place. However, only Hindus are allowed inside. Construction of the Jagannath temple dates back to the 12th century. It was initiated by Kalinga ruler Anantavarman Chodaganga Dev and later completed, in its current form, by King Ananga Bhima Deva. 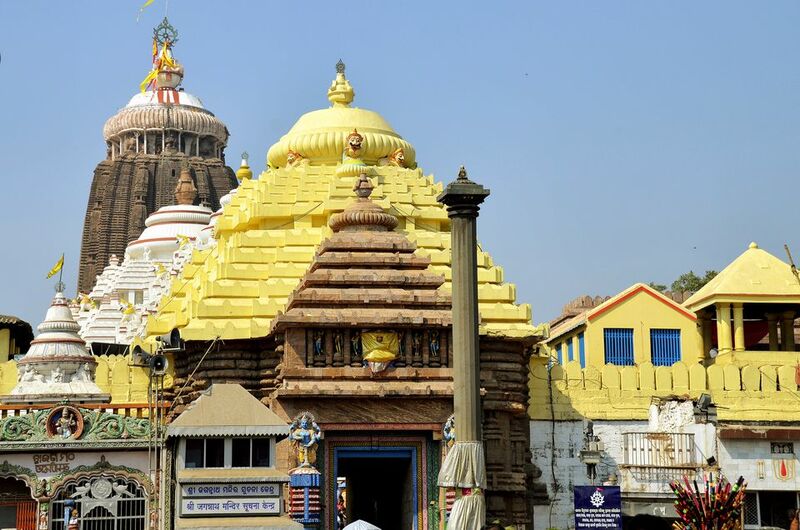 The temple is home to three deities -- Lord Jagannath, his elder brother Balabhadra, and sister Subhadra -- whose substantially sized wooden idols sit on a throne. Balabhadra is six feet tall, Jagannatha is five feet, and Subhadra is four feet tall. Lord Jagannath, considered to be the Lord of the Universe, is a form of Lords Vishnu and Krisha. He's the presiding deity of Odisha and is integrally worshiped by most households in the state. The culture of Jagannath worship is a unifying one that promotes tolerance, communal harmony, and peace. Based on the char dham, Lord Vishnu dines at Puri (he bathes at Rameswaram, gets dressed and anointed at Dwarka, and meditates at Badrinath). Hence, a great deal of significance is given to food at the temple. Referred to as mahaprasad, Lord Jagannath permits his devotees to partake in eating the 56 items that are offered to him, as a means of redemption and spiritual advancement. Unmissable, standing around 11 meters high at the Jagannath temple's main gate, is a towering pillar known as the Aruna Stambha. It represents the charioteer of the Sun God and used to be part of the Sun Temple in Konark. However, it was relocated in the 18th century after the temple was abandoned, in order to save it from invaders. The temple's inner courtyard is reached by climbing 22 steps from the main gate. There are approximately 30 smaller temples surrounding the main temple, and ideally, they should all be visited before seeing the deities in the main temple. However, devotees who are short on time can make do with just visiting the three most important smaller temples beforehand. These are the Ganesh temple, Vimala temple, and Laxmi temple. Other notable features inside the 10 acre Jagannath temple complex are an ancient banyan tree (which is said to fulfill devotees' wishes), the world's largest kitchen where the mahaprasad is cooked, and Anand Bazar where the mahaprasad is sold to devotees between 3 p.m. and 5 p.m. daily. Apparently, the kitchen produces enough food to feed 100,000 people each day! At the western gate, you'll find a small museum called Niladri Vihar, which is dedicated to Lord Jagannath and the 12 incarnations of Lord Vishnu. Apparently, more than 20 different rituals are performed at the temple daily, from 5 a.m. until midnight. The rituals reflect those carried out in everyday life, such as bathing, brushing teeth, getting dressed, and eating. In addition, the flags tied to the temple's Neela Chakra are changed every day at sunset (between 6 p.m. and 7 p.m.) in a ritual that's been going on for 800 years. Two members of the Chola family, which was given exclusive rights to hoist the flag by the king who built the temple, perform the fearless feat of climbing 165 feet without any support to affix new flags. The old flags are sold to a few lucky devotees. Vehicles, with the exception of cycle rickshaws, are not permitted near the temple complex. You'll need to take one or walk from the car park. The temple has four entry gates. The main gate, known as Lion Gate or the eastern gate, is located on Grand Road. Entry to the temple compound is free. You'll find guides at the entrance, who will take you around the temple complex for around 200 rupees..
attend the public darshan (viewing) is held for an hour each morning. This is known as Sahana Mela and usually happens between 7 a.m. and 8 a.m., after the Abakash Puja (bathing and brushing of the god's teeth). buy a "Parimanik Darshan" ticket from inside the temple complex. These tickets cost 50 rupees (the price was increased from 25 rupees effective June 1, 2014), and holders are permitted to only go in at set times of the day after certain rituals. These include the Mangal Aarti, Abakash Puja, Sandhay Aarti, and Chandan Lagi. The times are 5 a.m., 8 a.m., 10 a.m., 1 p.m. and 8 p.m. Arrive 30 minutes beforehand to buy tickets. Otherwise, you'll only be able to see the deities from a distance. There is also a ticket system in place for viewing the temple's famous kitchen. Tickets cost 5 rupees each. Allow a couple of hours to completely explore the temple complex. Do note that repair works are currently going on in inside the temple and are expected to continue throughout 2018, so it may not be possible to see the deities closeup. There are unfortunately many reports of greedy pandas demanding excessive amounts of money from devotees. They are known to be experts at extracting money from people. Once you enter the temple complex, they will approach you in groups, offer you various services, cajole you, insult you, and even threaten you. It's strongly recommended that you ignore them. If you do wish to avail of any of their services, make sure you negotiate the price beforehand and do not give any more than agreed. The pandas frequently ask devotees for money when visiting individual temples inside the complex. They are particularly ruthless when it comes to the viewing of the main deities in the inner sanctum. They will insist on payment order to get close to the idols, and will not allow anyone to touch their heads to the altar unless money is put on each of the platters in front of the idols. Pandas are also known to deceive devotees into giving them money to bypass purchasing Parimanik Darshan tickets and the line to enter the inner sanctum. Payments to the pandas may get you past the barricades but you still won't be able to see the idols unless you have a valid ticket. If you park your car in the parking lot and walk to the temple, be prepared to be approached by insistent pandas offering their services on the way. To avoid most of the pandas, get up super early and try to be at the temple by 5.30 a.m., as they will be busy with the aarti at this time. Note that you're not permitted to carry any belongings inside the temple, including cell phones, shoes, socks, cameras, and umbrellas. All leather items are banned as well. There is a facility near the main entrance where you can deposit your items for safekeeping. Why Can't Non-Hindus Go Inside the Temple? The rules of entry into the Jagannath temple have caused considerable controversy in the past. Only those who are born Hindu are eligible to go inside the temple. However, some examples of famous Hindus who have not been allowed in are Indira Gandhi (the third Prime Minister of India) because she had married a non-Hindu, Saint Kabir because he had dressed like a Muslim, Rabindrinath Tagore since he followed Brahmo Samaj (a reform movement within Hinduism), and Mahatma Gandhi because he came with dalits (untouchables, people without a caste). There are no restrictions as to who can enter other Jagannath temples, so what's the issue at Puri? Numerous explanations are given, with one of the most popular ones being that people who do not follow the traditional Hindu way of life are unclean. Since the temple is considered to be the holy seat of Lord Jagannath, it has special importance. The temple caretakers also feel that the temple is not a sightseeing attraction. It's a place of worship for devotees to come and spend time with the god that they believe in. Past attacks on the temple by Muslims are sometimes mentioned as reasons too. If you're not a Hindu, you'll have to be content with viewing the temple from the street or paying some money to view it from the roof of one of the nearby buildings. Once a year, in June/July, the idols are taken out of the temple in what is Odisha's biggest and most iconic festival. The 10 Day Rath Yatra Festival sees the gods being transported around on towering chariots, which have been made to resemble temples. The construction of the chariots commences in January/February and is an intensive, detailed process. Read about the Making of the Puri Rath Yatra Chariots. It's fascinating! See photos of the Jagannath temple on Facebook, or visit the Jagannath Temple website.